Mark your calendars: Feb. 27 is National Term Limits Day! Less than a month away! With a renewed push to impose term limits on the U.S. Congress, a new national day has emerged from the term limits movement. The idea is simple enough. On February 27 each year, everyone is encouraged to make a show of public support for term limits. This can be as simple as posting a term limits sign in your yard or wearing a term limits t-shirt or hat on term limits day, February 27. 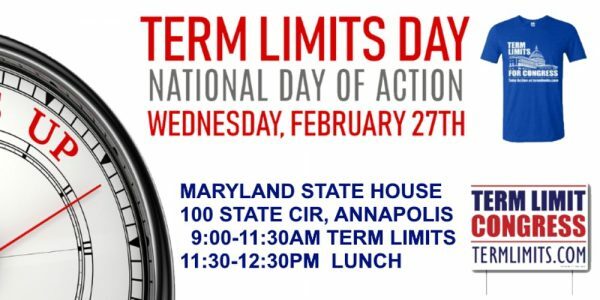 We’ll be Facebooking, tweeting, and promoting videos on social media using the hashtag #TermLimitsDay to send a message to remind our Federal and State representatives that the masses support term limits. Remind the politicians that our support is not passive. We expect action from our representatives and we EXPECT IT NOW. Lunch Included Be creative and help us grow the movement for TERM LIMITS!